This is my last post in this series and I am writing about how we have handled deployments of other required elements in our Sitecore ecosystem. Typically Sitecore deployments has 2 aspects. Some customers deploy this as one single package on one server and have a Windows DFS or similar tools (such as Repliweb) to sync files from master to slaves. It adds more complexity if you have different configurations for different roles e.g. for CM, CD and Job (Publishing) server. Separate file system package as a Nuget package - We deploy this on all servers in an instance, one by one. We also created a utility that will take any zip / update packages as the input and allows you to create it as a Nuget package. This was needed for us to separate out the files and items packaged in Marketplace modules or Sitecore update packages or Sitecore zip packages. It provides you flexibility to select and configure the folders where each individual files will be deployed and also allows you to publish these packages in the configured Nuget repository to take it off for environment wide deployments. Long-term through process is also to pre-process required Sitecore modules in Nuget packages and deploy them as pre-requisite whenever we need, using Octopus Deploy to create our own Sitecore instance. 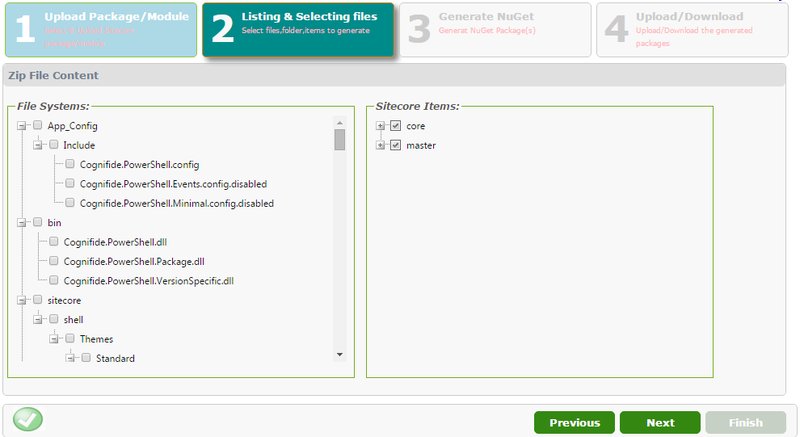 Following screenshot shows different steps in the custom utility we created. This is my third post in this series and I am going to talk about different ways to handle configuration changes specific to each environment OR even each role within an environment. While handling deployments in multiple environments, it is always a question with respect to how to handle environment specific configuration changes? This is not a new problem to solve for !! There are primarily two stages wherein you can handle environment specific configurations in automated way (without relying on error prone manual editing of configurations by logging into specific environments and performing live changes). Handling it at the time of build phase through your continuous integration platform. Problem with this approach is for each environment, you need to run a separate build to ensure the transformations are run for that specific environment and the resulting packages include relevant configurations. With this approach, you are deploying different packages in different environment (though you would have ensured to take the artifacts from the same tag to ensure you are building the right code and packaging the right configurations. Other way to handle this is during deployments. You create a package once and you promote it to various environments as it is. Package contains all the configuration transformation rules you need for each environment right from the beginning. Platforms like OctopusDeploy has a built in support for doing transformations at the time of deploying a release. Alternatively, for some of the common configurations such as AppSettings and ConnectionStrings you can choose the configuration variable replacement concept at the time of deployment. You can read more about it here. Configurations that go under sitecore configuration element, Sitecore already has a patching logic which works similar to configuration transformation and Sitecore handles that pretty well. We did not want to re-invent the wheel to do it using our own / visual studio style, also for a reason that we started on handling environment related configurations in automated way little later. This is not to say that what we did was not right, perhaps you may want to keep it the same way even if you are starting your engagement just now. One of the hurdles and debate we came across is - should we include web.config in our package? Usually this is provided by Sitecore as a product and it’s a bad idea to deploy your own web.config will all changes incorporated in it. We wanted to stay away from that by just keeping the config transform rules on top of web.config and not touching the original web.config. But OctopusDeploy does not run the transformation rules if original web.config is not part of the package (because when Octopus extracts the Nuget package, it first runs the transformations before it copies over to the destination folder). We finally decided to include web.config that comes as part of Sitecore default installation (for the Sitecore version we use) and took a cautious call to change it whenever we upgrade to newer version of Sitecore. Challenge was, someone still needs to maintain it in the source control repository and they have to decrypt, change and encrypt it again. OctopusDeploy, as stated earlier, provides a nice feature to replace connectionstrings by means of variable feature, at the time of deployment. OctopusDeploy handles transformation at the deployment time but it runs it only at an environment level and not at the role level. In our situation, and probably any Sitecore deployment situation, we had several roles as stated in my previous blog, and it was unfortunate that we could not do transformation rules execution at the role level (such as CM / CD, Job etc.). OctopusDeploy is a nice deployment frameworks which works against Nuget packages. If you are not already using any deployment automation platform then you should definitely consider OctopusDeploy as a platform, not only for Sitecore but also for enterprise wide Microsoft solutions delivery. In-built Nuget feed which would be enough for small engagements. Ability to do configuration transformations at the time of deployment to specific environment. Ability to listen to any external Nuget feed. Ability to create variables and scope it at each Environment, Role or Machine level or combination of it, to define contextual values. This comes very handy to make your deployment process generic and repeatable. Ability to create automated releases, which will be helpful if you intend to setup continuous deployment to your pre-production (development / demo) servers. Integration with your existing Active Directory. You will need few service accounts with specific permissions to folders on each VM, execute PowerShell to deal with IIS, Nuget package deployment, restart app pools, read certificate store etc. You will also need a Sitecore user who has access to install packages, issue publishing and indexing requests as part of deployment process. If you also have steps for database backup / script executions / restorations, consider a SQL Server user having that level of access. Create test Sitecore deployment servers to ensure your deployment process works once its ready and also during the instrumentation phase so that you have some place to do try things out. Plan for testing all the tentacles in all your environments. Even though you tested your deployment process in test environment, you do not want to try deployments first time in production without ensuring if the tentacles and all necessary permissions are granted as expected in those machines in Production. Find out size of your packages and how long it takes to deploy / install your packages. You may need to tweak some timeouts at firewall or app pool level to be able to handle medium / large packages if those take beyond 5 minutes or so. Give due considerations on how would you deploy web packages (not Sitecore). Do you have distributed file sync mechanism? or do you want to rely on Octopus? We got away with file sync mechanism and handled all package deployments using Octopus. If so, you also need to think about how would you deploy Sitecore Modules or hotfixes received from Sitecore? They usually many not be available in Nuget package format. We addressed this by developing our own tool to convert and package anything on the file system to Nuget package. CM-Job - We share the same Job server VM across multiple production instances (not exactly how it is shown in the picture above). To be able to do that we run multiple Sitecore instances on the Job Server VM and for each of the Sitecore instance we have a Octopus tentacle service. OctopusServer - This is Octopus Server itself which is used to execute Database scripts remotely using SQL Management Objects and client library. We did not want to install tentacle on database server. We have about 20 step deployment process and some of the steps has child steps within it. As a first step, we check if the instance is up for us to do the deployment (this is different than tentacle health). We do this using PS command Invoke-WebRequest and checking the status code to match 200 OK. If the above step successful, we install a TDS service package (to ensure its there - this is converted to nuget package by us and uploaded to Nuget feed) which is needed for Sitecore package installation. Then, as shown above, we deploy the Sitecore Packages only on servers which are in Master roles (CM-Master, SingleMaster etc.) and below is how we do it. Package path parameter is the path where Nuget package deployment task has extracted the Sitecore update package. Next we do a web package deployment using Nuget package deployment step (available in Octopus library) as shown above. We also do a file clean up to delete certain files which are not required on CM Master role e.g configs which are specific to CD or publishing / job server needs to be deleted. Note: The configuration transformation happens at this stage for specific environment where deployment step is being executed. Once Nuget package is deployed, we do a clean up using file system clean up task in OctopusDeploy for specific files and configurations not relevant for Content Delivery servers. AppPool Recycle Requests - Ideally you should not need any explicit application pool recycles but sometimes to clear the HTML output cache on priority we may need to have this in place. We created a separate Octopus project to handle this. Project of this nature must be secured and permissions must be granted only to appropriate group of users such as Octopus Administrators. Pre-requisite deployments - In our engagement, there are lot of other dependencies such as device detection database from 51 degrees or a security roles and permissions package etc., which are relevant whenever we are setting up a new instance or rarely changed and deployed but not as part of regular releases. You can either have these steps executed conditionally (by means of checking if those already exists on the instance) or have a separate project, like we have, to deploy the pre-requisites first before making your releases. While working on one of the biggest Sitecore Implementation, few years back there was no guidance nor the defined process for Continuous Integration and Deployment for Sitecore. We have learned our lessons hard way and wanted to ensure that other folks in the community does not go through the same pain. Please note: We are using TDS in all three phases. And In deployment we are using PackageInstaller.exe that comes with TDS to install Sitecore packages using Powershell. If you have multiple teams working on the same Sitecore platform, better separate their responsibilities and areas in Sitecore where they work. TDS allows you to sync the children under the parent but if you have two teams working on the same folder / root item, when you install the package with these settings, you may step over one another and end state will not be what you desire. Consider cloud based source code repository such as Bitbucket OR any other GIT based repositories. This will allow you to do feature based development, facilitate multi-geo development and avoid additional infrastructure to support. This will also depend on your legal and regulatory compliance. 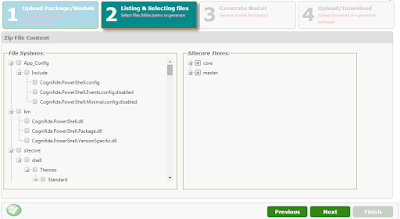 Use SlowCheetah to create configuration transformation files (other than web.config). This way you can also preview transformed configurations right in the visual studio. For CI, you can use any of the Continuous Integration platforms as long as it supports MS Build, PowerShell and also has plug-ins to generate Nuget Packages. Once the packages are built, CI platform publishes these package into the Nuget feed hosted by Nuget servers such as Proget. You can leverage this server to matinain enterprise nuget feeds and keep all your nuget dependencies project / enterprise wide. In the next blog I will talk about overall deployment process and considerations for the same using OctopusDeploy.